This article was written on 16 Oct 2015, and is filled under Author: dew. When it comes to horror movies, we all have our favorites. Some are in it for the blood and gore. Some are looking for spine-tingling frights. Some even want to find a Byronic vampire to fall in love with. Personally, much as I love a good vampire film or a silly teen slasher, my heart has always truly belonged to the haunted house story. Give me a decrepit old manor house and a few malevolent spooks, and I’m yours. 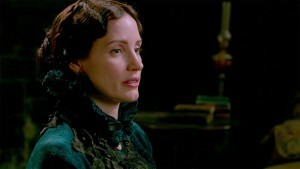 For this reason, when whispers began about Guillermo del Toro’s latest venture, Crimson Peak, I was all ears. The story itself seems simple: a young woman and aspiring writer meets a mysterious English aristocrat and is soon whisked away to his ancestral home, a hulking estate that has seen far better days and seems to harbor more than a few restless spirits. On the face of things, it would seem to be a classic haunted house film, but as the plot unravels, it proves to be so much more than that. Edith Cushing (Mia Wasikowska of Tim Burton’s Alice in Wonderland) lives a sheltered life, daughter of a self-made successful businessman, played by Jim Beaver (a Supernatural fan favorite); she lost her mother at a young age and had her first experience with a ghost not long after, the inky black skeletal specter of her mother appearing to the child in her bedroom with a dire warning: beware of Crimson Peak. Years later find Edith a hopeful writer, scribbling tales of ghosts while carrying on a stilted and awkward courtship of sorts with Dr. Alan McMichael (Charlie Hunnam) who seems charmed by her vocation, in spite of his uppity mother and sister’s clear low opinion of the girl. It would be the perfect setup for a comedy of manners, if not for the haunting figure that had frightened Edith out of her wits as a child and is set to soon make a return. Enter the dashing Englishman, Sir Thomas Sharpe, played with soft-spoken words and endless charm by Tom Hiddleston, perhaps best known for his portrayal of Loki in the many Marvel franchise films as of late. At his side is his stern sister Lucille (Jessica Chastain) as the two seek out funding for a mining enterprise back at their English estate. The whirlwind romance and paltry love triangle are to be expected, though it is clear that there is something not quite right in the muttered conversations between Thomas and his sister; Lucille cuts an icy figure, strange and clearly protective of her brother’s interests. Mr. Cushing is certain something is awry and contracts with a private detective (Burn Gorman) to find it all out. This all takes place in the first act of the film, which is centered primarily in the moneyed society of early 1900’s New York. The frivolity of it all is underscored by the feeling that something is not quite right; a long preface that easily could have left viewers with fading attention still manages to hold interest, long before reaching the Allerdale Hall, where the meat of the story takes place. 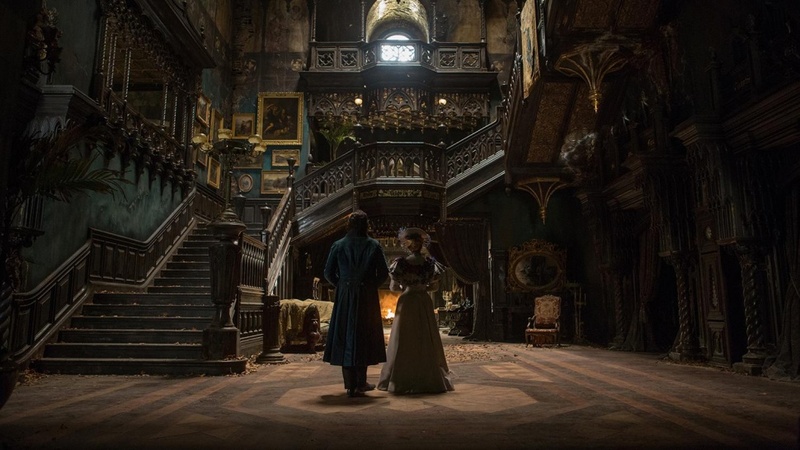 Anyone who has seen a Del Toro film will know of the amazing set pieces and backdrops that flavor his works, and Crimson Peak is no different. The manor house is amazing, a mixture of extravagant wealth and decay, a clear picture of a squandered fortune in a huge mansion falling to pieces around them. The floors are sinking in the red clay mud from which the family had made its fortune, the ceiling broken through in the grand entry hall and the wrought iron elevator running of its own volition. Polished hardwood floors in the halls just as quickly become grey and beaten down, tapestries and wallpaper eaten by moths in one room and brilliant and beautiful in the next. The Sharpe’s world is literally falling apart around them. The isolation and faded grandeur of the home is made all the more clear when seen on the big screen, streaks of red clay oozing down the walls as though the house itself were bleeding, taps running blood red before clearing out, and cobwebs and clutter tucked away in every corner. Many viewers, myself included, might dream of wandering its cavernous halls and seeking out whatever secrets it holds. Once isolated at the snowy manor, Edith begins to see that her marriage to Thomas holds more mysteries than she might ever have thought. She wakes often to find him missing from their marital bed, and Lucille becomes ever more grim and unpredictable. To make it all the worse, when left to her own devices, Edith continually comes across grotesque specters as red as the clay in the ground, screeching at her and clawing their way towards her with intent she cannot fathom. Thomas and Lucille dismiss her fears time and again, leaving Edith unsettled and woefully alone, while Dr. McMichael works tirelessly on the other side of the Atlantic to discover the truth of what is to become of his former paramour. 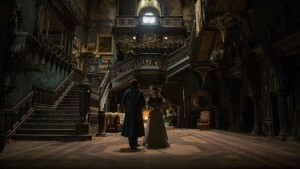 Tom Hiddleston is, as expected, a wonderful antihero for the film; Jessica Chastain, hair black and complexion pale, is a remarkable contrast to her film-brother’s warm and kind nature, in what could have been a dour performance likened to a latter day Mrs. Danvers and yet becomes a curious and mesmerizing portrayal of the strange and secretive Lucille. Mia Wasikowska plays to her appearance in a waifish performance that, like her Alice, gives way to hidden strength. Jim Beaver’s turn as the protective father is sure to make any viewer not already familiar with his body of work quite fond of his paternal portrayal. The film is not perfect — few ever are. There are a few small issues here, though nothing particularly damning. The use of inset location titling and iris wipe film transitions seem a little dated, which is a shame when set against the lush backgrounds of the film. The biggest hiccups seem more or less circumstantial: the elegant and refined Victorian era speech seems odd coming from an American accented voice and falls hard against the ear, and there is something oddly off-putting about Charlie Hunnam’s hairstyle — silly small things that may cause a viewer to frown for a split second but are just as soon forgotten. This is a film with a strong story and meat on its bones that still brings in the hallmarks of haunted houses, with doorknobs turning by an unseen hand, pets spooked by abominable unseen creatures, and the wonderful Doug Jones in a role as a shrunken, shambling, bloody ghost. If you are looking for a bloodbath, this is not the film for you. If you want violence and butchery with not much in the way of plot, then move on. But if you want to see a masterpiece of suspense and foreboding mystery, and aren’t afraid of a romantic subplot or two, you need to see this film. 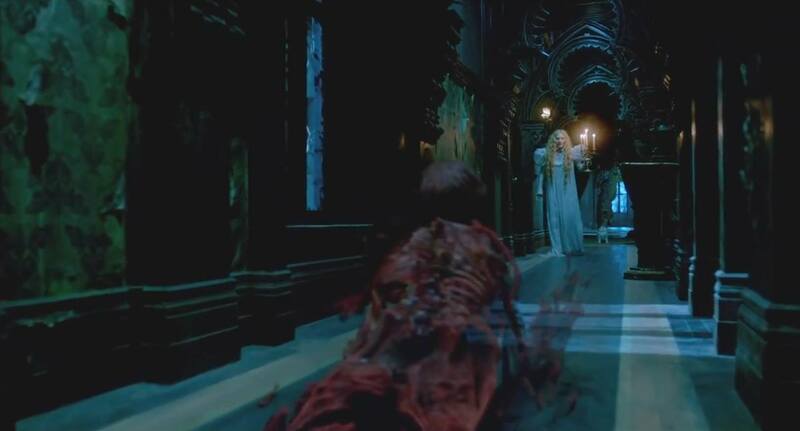 Crimson Peak will, most definitely, become a classic in the haunted house genre.